People live such fascinating lives. Their struggles, their triumphs and failures, make for absorbing and inspiring reading. And as we learn about other people's lives - we learn to understand our own better. No wonder that LifeLines is one of the most popular columns in Jewish periodicals, the one many readers turn to first. The first collection of LifeLines stories in book form were enjoyed by many thousands of eager and interested readers. 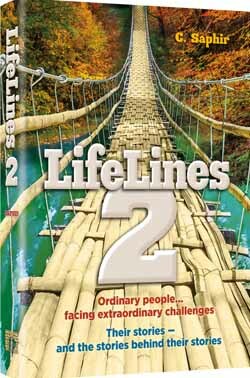 Now, in LifeLines 2, author C. Saphir shares with us still more real stories of real people, with an important bonus feature - detailed "Postscripts" that bring us updates on the narrators’ lives. In LifeLines 2, we’ll meet the mother of two hearing-impaired children, traveling with her on her journey to acceptance. In the Postscript, we will jump ahead several years and share her new challenge, as she learns to give her now-teenaged children the space to grow despite their disability. WeÂ’ll hear the story of the girl who was determined to shake off her Chassidic heritage, yet who finds the perfect spouse in a Chassidic young man. The narrative is fascinating, and the Postscript, in which she details how she joined her husband's community and yet maintained her own unique identity, adds another riveting level to the story. The medical student who discovered Torah through a popular TV series. The father of a child who's left the Torah world, the woman who ends a lifetime battle with obesity through gastric surgery, the boy with undiagnosed Asperger's who taught himself how to communicate: we will meet these people, and many more like them, people who have won their battles and surmounted their challenges. We will meet them - and we will grow from hearing their stories.